Even if you haven’t heard of Cascadia, chances are you have heard of the environmental mindset of those who live in the Pacific Northwest. At base level, this is the entirety of Cascadia, but once you delve into it, you realize the movement isn’t just an idea, it is a way of life. Firstly, let us establish what exactly Cascadia is and what it is not. Cascadia is a Pacific Northwest secession movement based on bioregionalism, cultural unity, personal liberty and environmentalism. The locations usually involved would be British Columbia; Oregon; Washington; Northern California and less commonly, pieces of Idaho and Southern Alaska. 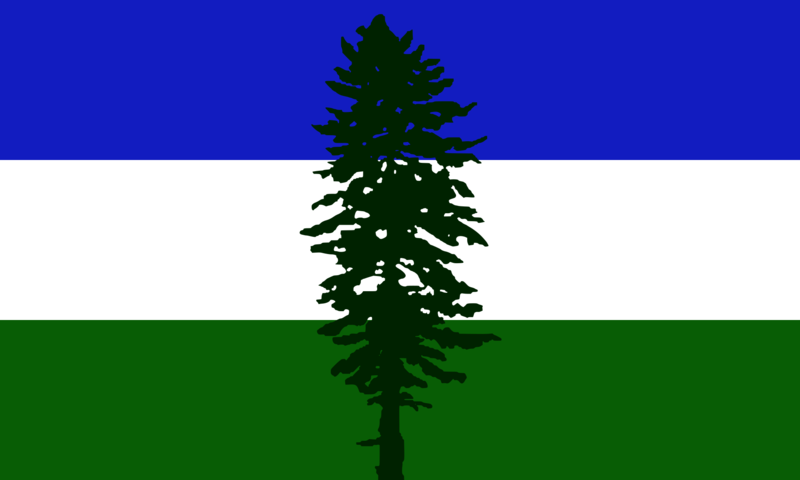 Cascadia is not to be confused with Northwest Front (NWF) which is a white nationalist movement who has taken the basic flag design and a similar location of Cascadia. The history of Cascadia is rich, and somewhat complex. There have been several movements previous to this, and the most famous is the concept of Jefferson State. This idea stems back into the early 1800s when Thomas Jefferson commissioned the Corps of Discovery Expedition (Lewis and Clark). The state, an independent nation and ideally a republic would be composed of Southern Oregon and Northern California. This movement gained traction in late 1941, but lost the momentum after the events of Pearl Harbor. Since then, there have been surges of commitment to the idea of Jefferson, but this idea has, for the most part, merged with the larger Cascadian movement. Cascadia’s main premise is freedom from the United States, supported by the idea of bioregionalism, as mentioned earlier. What is this exactly? Bioregionalism is essentially the relationship between environmentally focused cultures and bioregions (geographic areas with several shared ecological traits and characteristics). A loose analogy is civic/liberal nationalism, but with an emphasis on Human-Earth interaction and relationships. With the idea of secession comes personal liberty. Cascadians in general want to battle not just in the defense of Earth, but for minorities, LGBT+ members, women and the disabled. This is self evident in one of their flag variants, which features the iconic Douglas Fir (hence the flag name) with a rainbow background in reference to LGBT+. In addition, they support Marijuana legalization, an open trade within their nation as well as a better sense of community and autonomy. Perhaps the most important point, which directly ties into the sense of bioregionalism and all previous factors is environmentalism. The idea of a healthy Human interaction with the environment is at the core of many Cascadians. The movement pushes for a sense of ecological responsibility and a culture based on understanding Humans are apart of nature, not above it. Going back to the concept of Bioregionalism, it is important to know not just what it is, but how it plays into Cascadia as a whole. The social aspect of the bioregion formed in the 1970s when scientists within the sociology, biology and environmental fields as well as community leaders and landowners began to work together with the vast natural resources. Cascadian Bioregionalism is of course, concerned with PNW (Pacific Northwest) bioregion. 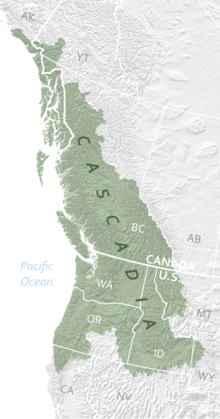 Politically, this sense of connection in the proposed Cascadia causes a rift between the States and Canada region and their capitals. Two leading characteristics make up the accepted bioregion: The Cascade Range and the Columbia River watershed. In relation, fauna; flora; soil makeup and climate help make up the details. The basic concept is this: The states and territories have more significant biological and geographical characteristics in common than with Washington D.C. or Ottawa, which then creates a cultural and economic divide. Essentially, environmentalism and bioregionalism go hand-in-hand quite well. In the eyes of the supporters, Humans can live in a comfortable manner while protecting and assisting nature in its attempt to recover. While the idea of seceding from the Union and Canada is a very far fetched idea, it doesn’t mean they cannot make smaller pushes for the same reasons for which to want to secede. For example, the states of California, Oregon and Washington are members of the United States Climate Alliance, a non-legal binding between several other States (in addition to Puerto Rico) to uphold the Paris Agreement after President Trump pulled from the agreement in June 2017. With the growing sense of independence and environmentalism, perhaps it is time to combine these concepts and create a truly free Cascadia. Original article was published by medium.com and can be viewed in full here. The United Green Alliance has posted already posted an article on the political goals and support for Cascadia, however this is a more social and scientific approach for the same subject: The free nation of Cascadia! Make sure to check out all their articles on medium. Mariah Cook; A.S. Robak; Rose F.